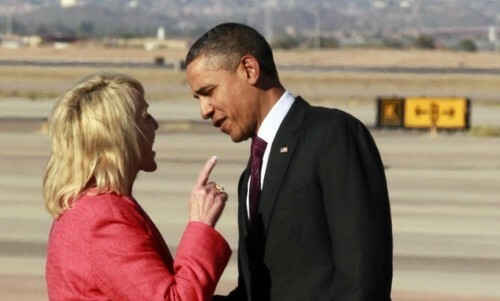 It is now all over the web - Jan Brewer stood tough in the face of the president and showed him who's boss. Brewer even hit the airwaves after the encounter to insult the president some more, calling him "thin skinned," but is that really the truth? The president does not seem to think so. "I think it's always good publicity for a Republican if they're in an argument with me. ... But this was really not a big deal," Obama said. "Last time we met, she wasn't fully satisfied. But, you know, I think this is a classic example of things getting blown out of proportion." The president is one hundred percent right and I will point to another famous (and recent) example where things went the other way, and a popular Republican governor embraced the president - Charlie Crist. But starting with Sen. Joe Lieberman , the hug became political poison. Democrats used his embrace of George W. Bush, and Bush's peck on the cheek, to help force the Connecticut senator out of the party in 2006. Democrats used John McCain 's hug with George Bush to show that his claims to being a maverick were hollow. (Now McCain won't even hug himself ). Hugging is so fraught with danger that even Sen. Tom Coburn , the Oklahoma Republican whose conservative bona fides are beyond question, received critical letters when he hugged Obama before the State of the Union in January. Looks like Brewer just did not want to become another casualty of the political hug. Also, is Brewer really sticking it to the president or is she looking like she is yelling at Obama because they happen to be standing on the loud tarmac?